When we arrived in Mendoza after a 14 hour bus ride from Buenos Aires, the first thing that struck us was the local rhythm and pace. We left the hustle and bustle of Buenos Aires to arrive in a place where the pace is much, much slower. So much so that the “siesta” culture is very much a part of the community. You will find stores closed between 1pm – 5pm, knowing this will help you plan accordingly. 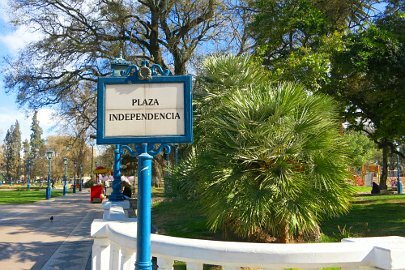 Mendoza is a desert town and it surprisingly doesn’t look like one because of all the green vegetation, palm trees and fountains around. The water comes from the Andes and you see it flowing through irrigation ditches (acequais) running beside the main roads in the city. Besides being the largest producer of Malbec, Mendoza is also the 4th largest city in Argentina and an important center for its proximity to Santiago, Chile and Aconcagua (the highest mountain peak outside of Asia at 22,800 ft).The city itself has wide avenues, lots of restaurants and cafes on pedestrian streets and the famous Parque General San Martin (San Martin Park). The splendid view of the Andes and the laid back pace, makes it easy to get captivated by the city. Mendoza has over 1500 wineries spread out in three main wine regions: Lujan de Cuyo, Uco Valley and Maipú . Lujan de Cuyo is known as Malbec land and was actually the first region to be a “designation of origin” (AOC) for Malbec in 1993. Uco Valley is one of the world’s highest wine growing regions, with over 80,000 hectares planted between 3,000 ft and 3,900 ft. Wines from grapes grown at this altitude are said to be among the best that Mendoza has to offer. 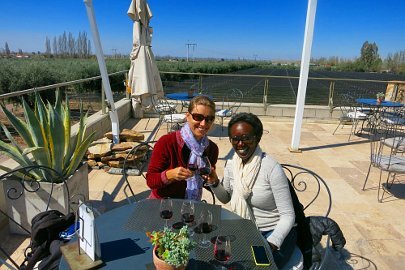 Maipú is 15 km southeast of Mendoza is a small town packed with wineries and olive oil farms and it’s easy to hit several wineries in a day. Renting a bicycle to move from winery to winery is a popular activity in this region. With so many wineries and regions to choose from and so little time, we decided to go “slow” and take the time to appreciate and learn as much as possible about the wines rather than to go broad with the objective of hitting as many wineries as possible. 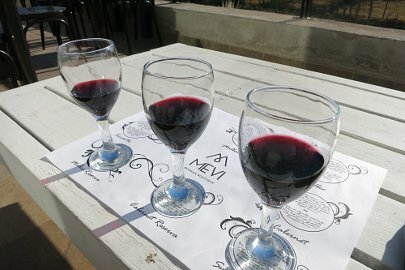 Note: There are many ways to experience the wines in Mendoza. 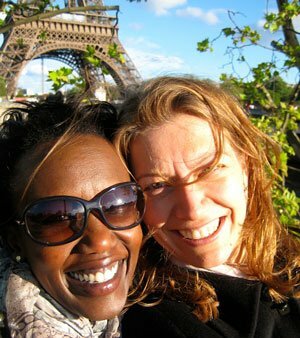 You will find options that include renting a car and driver for the day, which tend to be expensive. There is also the Bus Vitivinocola where you can visit wineries for a full day or half day (about aprox $25 – $35 USD pp) or you can research ahead of time and choose to visit a select number of wineries. 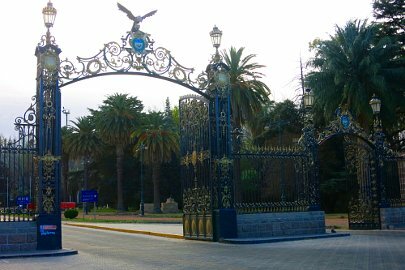 However you choose to experience Mendoza, be very clear on what kind of experience you are seeking. Are you looking for an in-depth experience or quantity? Are you interested in going beyond the Malbec wine? Are you open to smaller, off the beaten path wineries? Once you are clear on what you want, you will be able to find a suitable way to visit the wineries. We mapped out our itinerary based on three primary criteria. First, we wanted to visit an off the beaten path winery and were fortunate to have been introduced to the owner of a boutique bodega. 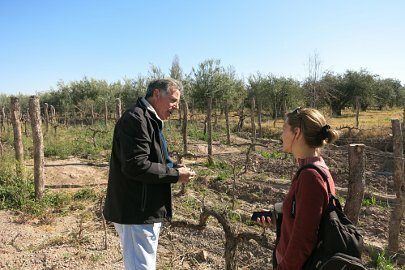 Secondly, we had heard a lot about organic wines in Buenos Aires and also witnessed the trend towards organic products and markets and were simply curious to learn about the next frontier in organic wines from Mendoza. 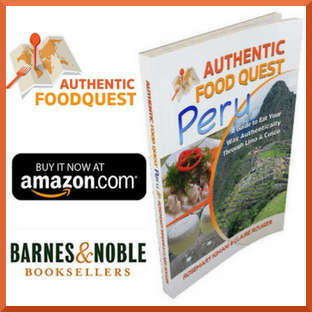 The third criteria was a desire to hit a winery in the Uco Valley, which is one of the world’s highest wine growing regions, with over 80,000 hectares planted between 3,000 ft and 3,900 ft. 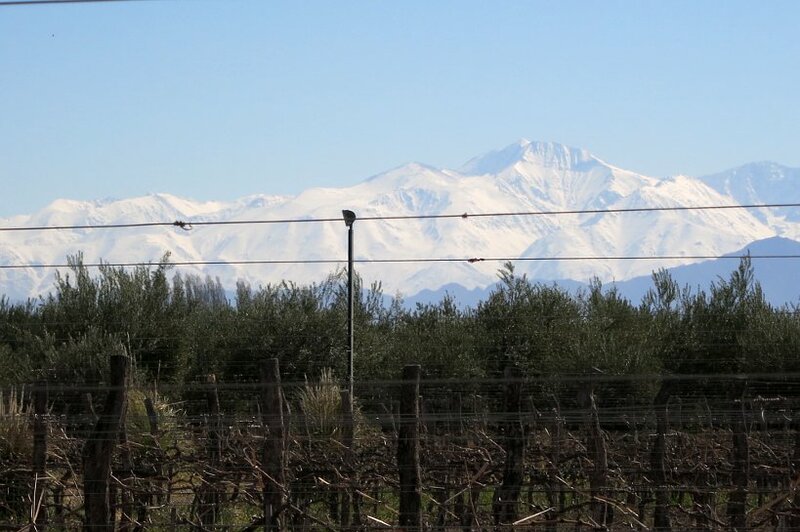 Wines from grapes grown at this altitude are said to be among the best that Mendoza has to offer. We will cover Uco Valley in a separate forthcoming post. 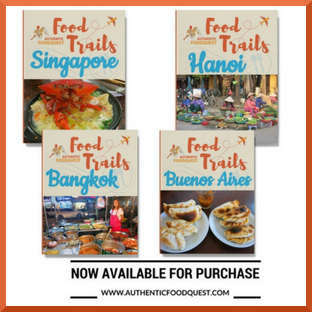 While we were in Buenos Aires, through locals, we got the opportunity to meet the owner of a boutique bodega. Oscar Vignart, who is the “Vi” in Mevi and his partner bought the winery in 2010 and opened it up for tours in 2011. Always passionate about wine, this is actually Oscar’s second bodega. 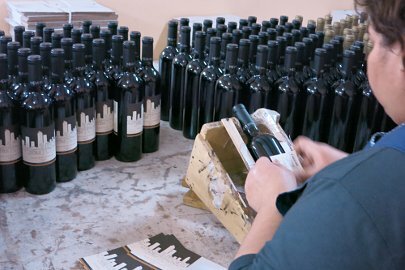 He bought and sold his first vineyard in the 90s and he aspires to make Mevi an international success as a boutique wine. The winery is situated in Maipú and is a short bus ride from Mendoza. The bodega is conveniently located next to other wineries so you can hit a couple wineries all within walking distance. Gino, manager and Oscar’s brother-in-law gave us a thorough tour of all aspects of the winery including the lab where the wine analysis is conducted. Energetic and passionate about wine, Gino started the tour outside at the vineyard, where we learned the majority of their grapes are dedicated to Malbec. They also have some Cabernet-Sauvignon, Syrah, and few grapes for the whites Chardonnay and Torrontés. Gino spoke intensely about care that goes into the wine-making process. The grapes are hand picked and they are manually sorted by ladies who remove the debris and rotten grapes leaving just the perfect grapes to through the process. The grapes are then aged in either stainless steel tanks or American or French barrels for 1 to up to 3 years depending on the grapes. Finally the manual and labor intensive method of labeling each bottle. 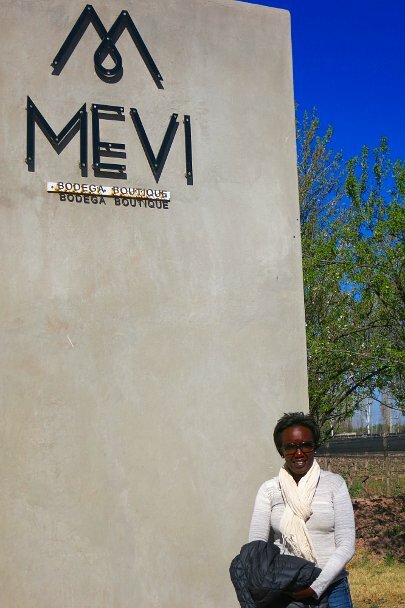 From the tour you got a real sense of the care, attention and love that goes into the wine-making process at Mevi. 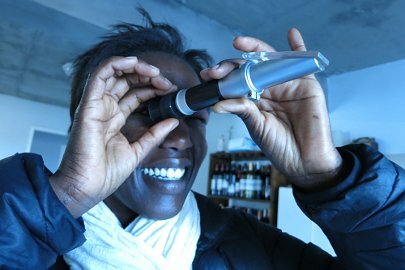 Tasting: Following the tour, we had an opportunity to sample several wines. We tried the Malbec, Malbec Reserva, Torrontés, Malbec Rosé, Cabernet Reserva and Syrah Reserva. We we pleasantly surprised by the Torrontés, which was light with hints of citrus fruits. The perfect wine for a sunny day. We were both blown away by both the Malbec and Malbec Reserva wines, which were deep and velvety living up to the Malbec focus of the winery. Where to find the wines: Mevi distributes their wines all over the world including North America and Europe. However, as a boutique bodega, they can’t compete with the “big” wineries and therefore their distribution is somewhat limited. 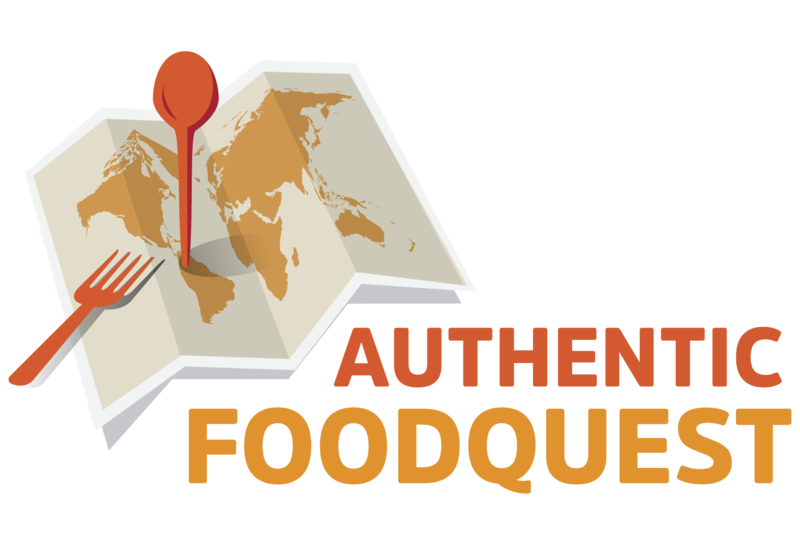 Part of their success has been through boca a boca or word of mouth and we highly recommend that you check out this bodega for intimate experience. 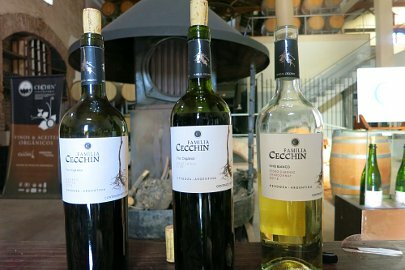 The trend that we have noticed in Buenos Aires towards organic foods, led us to discovering and hearing about Bodega Cecchin. The wines from this vineyard were recommended to us by several portenos who rave and speak highly about their wines. 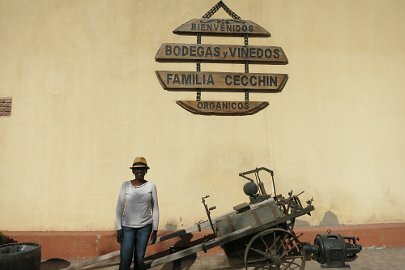 Curious to learn about organic wines, Cecchin was on our “must try” list. 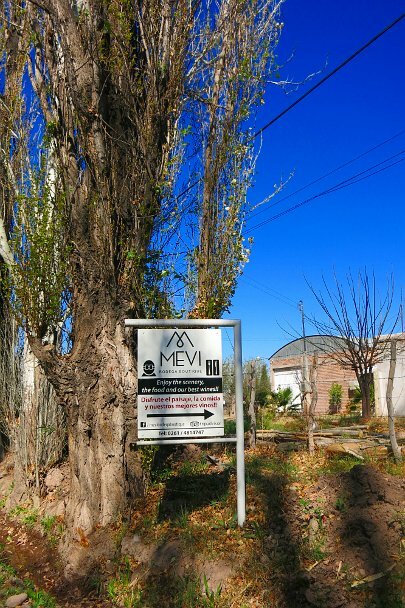 Getting to Cecchin was just as easy as it is also located in Maipú. Getting there was an adventure that took us a took a little longer due to a mix up of the bus numbers (story for another time):) We did eventually get there and just in time to start a tour of the winery and the organic wine making process. 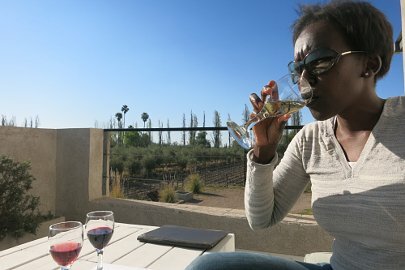 As an FYI, there are less than 10 organic wineries in Mendoza. 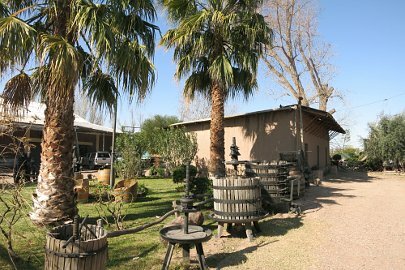 Family owned vineyard dating back from 1959 when the family Cecchin originally from Treviso Italy bought a working vineyard and continued their wine making tradition in Mendoza. 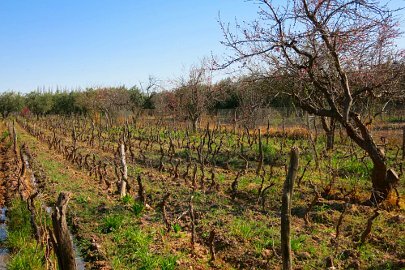 The family still runs the vineyard with the active involvement of the grandson’s nephew of one of the owners. So, what is an organic wine? Organic wines means that there are no chemicals used in the growing or fermentation process. 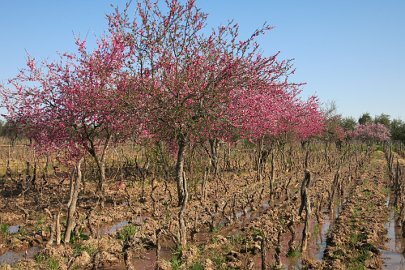 The way the bodega deals with insects, is by planting different fruit trees because the insects prefer fruits over the grapes. Mixed with the vines, you will see Peach, Orange, Almond and even Olive trees. The organic process is much more involved growing and harvesting according to lunar cycles. You may read more about biodynamic agriculture here. The harvesting of the grapes is done by hand and the fermentation process takes place in concrete tanks. 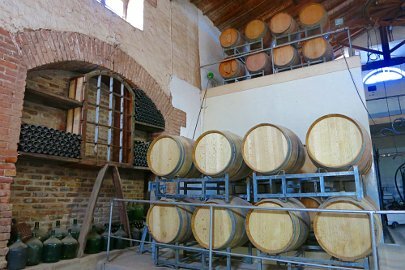 The fermentation process of the wines is generally the same all over, except that at Bodega Cecchin, they does not use any chemicals to enhance or adjust the fermentation process. Only about 10% of Malbec wine goes into American and French oak barrels. 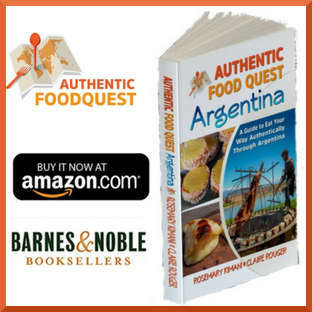 The majority of their wines, about 80% are exported and the rest sold in restaurants in Argentina. The vast majority of wines are exported to countries with an organic cultures such as; North America, Europe, China and Japan. Tasting: The tour took about 1/2 hour and was conducted in English. The tasting comprised of one Chardonnay and two reds – one Graciana (exotic grape from Spain’s Rioja region) and one Malbec Oak. The white was dry and the Graciana was a little too exotic. The favorite was the Malbec Oak which was a jammy, smooth easy to drink wine with hints of leather. A very nice wine. The tour and tasting costs 60 pesos pp (aprox $6.40 USD) or if you buy any wine, the tasting is free. Where to find the wines: Cecchin wines are available all over the world and your best chances of finding a bottle is probably at the organic section of your local wine store. Do keep in mind that this is a smaller winery and may not be widely distributed. 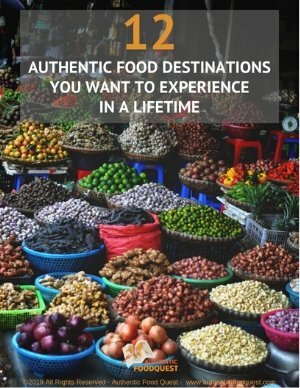 Definitively a unique and interesting bodega worth visiting. 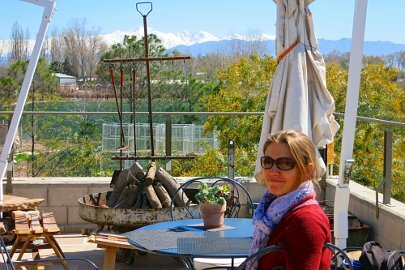 In Maipu and within walking distance to Mevi is Tempus Alba, a winery with a superb lunch and amazing views of the Andes off their roof top deck. Here we had the wine tasting menu to go along with our empanadas and tortas (pie & salad) lunch. Of the six wines we tried (3 samples per person), we both enjoyed the Malbec, Cabernet, Merlot and Tempranillo. Tips to get the most out of your visit: Make reservations for wineries and restaurants especially in Uco Valley and Lujan de Cuyo. 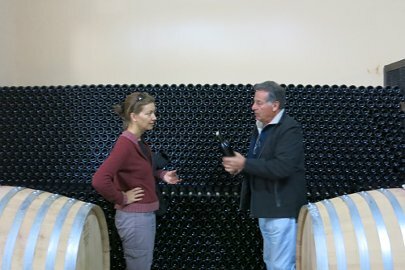 We stopped by three wineries in Lujan de Cuyo without reservations and were not able to get a tour. Don’t make the same mistake 🙂 Plan your trips by region to be able to get the most out of the experience of Mendoza wine regions. Seeing the vineyards against the Andes in Uco valley is a breath-taking experience. Give yourself the time to enjoy both the winery and the views of the Andes. Both deserve to be appreciated fully. Not all wineries take credit cards, be prepared with cash on hand. Please note that most bodegas are closed on Sundays and Mondays. Prepare and plan your visits accordingly and you will be enchanted by your visit of Mendoza wine regions! Excellent experience, the two first wineries are not of my favorites, but the third is an amazing winerie into Maipú area, if you come to Mendoza again don’t miss Lujan de Cuyo a region with important wineries and definitely Uco Valley is an area with amazing wineries and the vineyards grown at the foothills of the Andes. Thanks for your comments. We actually enjoyed getting off the beaten path and seeing a boutique winery – Mevi as well as understanding organic wines at Cecchin. We did actually make it to Uco Valley and will be posting about it shortly. Lots to visit and experience in Mendoza, but not enough time:). Gracias por sus comentarios y apoyo.